When JC (as l’Absinthe’s chef-patron likes to be called) took over the restaurant site on the corner of Fitzroy and Chalcot Roads, all he had in mind was a reasonably priced bistrotand wine shop to remind Primrose Hill customers of relais-routier meals on bygone family holidays in France. Too many restaurants had previously failed on this site so JC enlarged the ground floor dining room and made it more inviting with a big table in the window where passers-by would glimpse happy diners enjoying themselves and their food and wine. Then he donned a beret and flung open his doors, the better to greet passers-by, for JC was determined l’Absinthe would succeed in becoming an integral part of the neighbourhood. It worked a treat from the start, but what JC and restaurant partner Laurent had not anticipated was that in a couple of years the adjoining premises of Clare’s Kitchen would fall vacant. Too good an opportunity for two stalwart enfants de la patrie to miss. 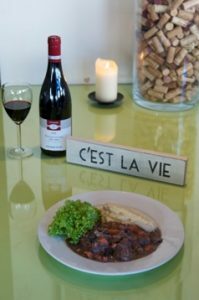 L’Absinthe now underwent major expansion to accommodate a bar and new 24-seat private dining room downstairs, and to add on at street level a traiteur for take-away lunches and take-home classic French cooked dishes like Boeuf Bourgignon (recipe below). A Burgundian classic from autumn’s wine harvest through to Lent. Cut beef into approximately 5cm pieces and marinate overnight in the red wine in the fridge. Peel carrots and onion and dice with mushrooms. Heat 2tbsp oil in a large frying pan and sauté lardons until they sizzle and start to shed fat. Add diced veg and continue cooking over medium heat for a few minutes, stirring regularly until they soften and begin to colour. Remove from heat and set aside. Drain beef well, saving the wine. Heat remaining oil in a deep pan and sear beef in batches to brown it. Return seared meat to the pan, season, sprinkle in the flour and stir well over heat until it is absorbed, then stir in wine from the marinade and bring to the boil. Add diced vegetables, lardons, bouquet garni and garlic and simmer uncovered for 2hrs 30mins, stirring occasionally. Check seasoning and serve with mashed potatoes or a creamy celeriac puree, plus a green salad on the side or to follow.